Sam Clarke Makes it back to back wins in the premier Multisport event. Defending champion Whakatane’s Sam Clark, stormed home in stunning fashion to win this year’s Kathmandu Coast to Coast Longest Day, crossing the line in a time of 11 hours two minutes. Clark backed up his number one seeding and pre-race comments where he said he would “see the others in New Brighton,” with a powerful display in the kayak and final bike leg to catch early race leader, Braden Currie, powering past him on the final bike leg to cross the finish line eight minutes ahead of the previous three time winner. Clark was one of nine riders that included most of the pre-race favourites, including Currie that broke away on the first 55 cycle leg. The leaders all split up over the mountain with Currie building an 11 minute lead over Clark heading into the short cycle leg that precedes the kayak. 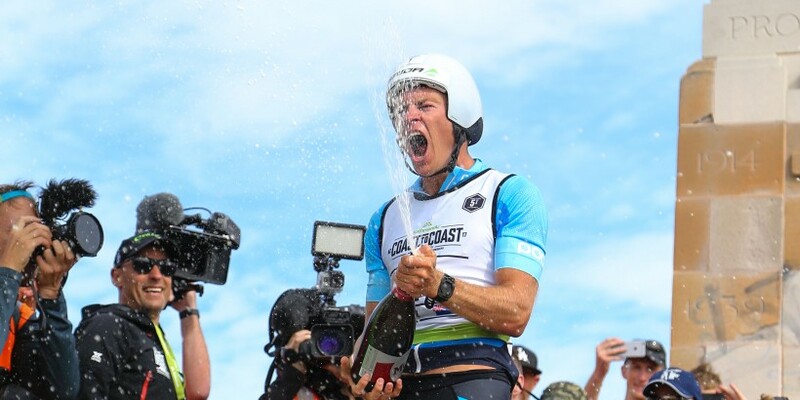 A renowned paddler, Clark was able to claw back time on the water, reducing the gap to four minutes as he climbed on the bike for the final 70 kilometre leg to New Brighton beach. Pushing a massive gear, Clarke caught Currie, taking the lead with just under 25 kilometres to go. Christchurch based Sam Manson achieved his best Kathmandu Coast to Coast result, coming home third in a time of 11 hours 37 minutes. Nelson’s Elina Ussher also made her winning move on the final bike leg after being passed by South Africa’s Robyn Owen on the 67 kilometre kayak leg, winning her fourth women’s Kathmandu Coast to Coast longest day world championship title. Ussher quickly went to work on the bike to reel in the South African Coast to Coast first timer, passing Owen by the half way point to come home in 13 hours 11minutes, 17 minutes ahead of Owen. Third in the women’s one day event was Hannah Wells, who came home 21 minutes after Owen. “It was a really long day today and a tough final bike leg so I’m really happy to win again,” Ussher said. In the two-day event, sixteen-year-old Cameron Jones from Nelson showed he will be a multisport name to watch for the future, winning men’s individual event in emphatic style, crossing the finish line more than half an hour in front of Oliver Thompson who was second. He is the youngest person ever to win a Kathmandu Coast to Coast individual title. .
Kathryn Buckenburg won the women’s two day individual event, producing a strong kayak to overtake day one leader Shannon Edgar, winning in fourteen hours and 10 minutes. The two person team’s event was won by Team Moa Hunters in a time of 12hours 44minutes while Team Visionstream Dream Team won the three person team’s event in a time of 11 hours 54minutes. « Can You Cram for Altitude?